This lovely vanity doubles as a writing desk when you conceal the drop-leaf mirror. 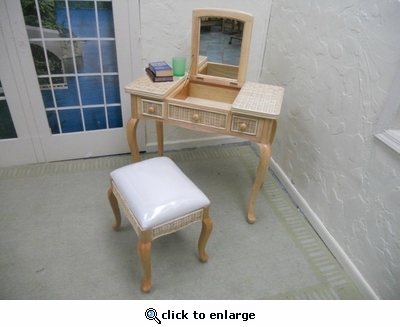 The vanity is made of hand-woven natural wicker over a wood frame with select hardwood accents. Each of the side drawers have wood pull knobs. The Queen Anne styled legs are handcrafted from select hardwoods. A matching bench is included with your choice of fabric. Sunbrella fabric available at an additional charge. Natural finish. Easy assembly required. (2) For $45 (refundable) you can order our Swatch Book containing over 100 designer fabrics (UPS $10).